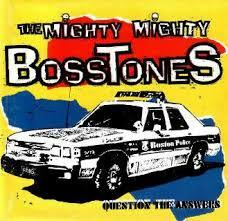 One of my favorite albums from my favorite bands is Question the Answers by The Mighty Mighty Bosstones. You probably haven’t heard of it, but I love it. (Mostly, by the way, because of how it spoke to me about my life when it came out. Anthony Bourdain said, “Context and memory play powerful roles in all the truly great meals in one’s life.” I think the same applies for albums). Beyond the music, it was also one of the first times I heard the phrase “question the answers.” Besides just being a pithy slogan, it pointed to a deeper idea: There is no final certainty that we can achieve that lets us slack off intellectually, morally, or ethically. The idea that we should continually question became an important principle for me as I continued to grow as a professional and a person. This idea of questioning came up for me lately because I seem to spend more and more time making statements. Between writing, speaking, podcast interviews, and the like, I’m making lots of statements about what works in professional development, how they should sell, and what activities can lead to success. Even more challenging, as I grow my speaking and writing, I’m engaging (and competing) with a lot of other “influencers”. There is only so much attention available from our audiences, so there’s this push to be louder and more obnoxious than everyone else. And it’s a lot easier to be a loud, obnoxious jackass when you’re making statements, rather than asking questions. I have to remember that my goal isn’t to be the loudest guy on the block. I don’t have to make booming pronouncements with complete certainty (regardless of veracity). Instead, my goal is to continually question all of the answers that I come up with. That way my statements can be as useful as possible. I promise that I’ll continue to question my answers. And I’ll be sure to share the best of both that I can come up with. Which answer can you question this week? Is there one from the newspaper, your workplace, or your past that can use some examination. Remember, questioning doesn’t mean dismissing or ignoring. It’s not about being indecisive. It’s about taking a critical look at how you arrived at the answer, and whether it still holds true. Did you find this article useful? Get my 19 ideas to super-charge your sales network!